A snapshot icon as seen through the viewfinder of a camera. Snapshots are a type of collectibles in Grand Theft Auto: San Andreas. Snapshots exist only in San Fierro, San Andreas, as a rotating circular camera icon around a particularly interesting scenic spot. As its name implies, snapshots are obtained by shooting the snapshot icon using a camera. However, camera icons are only visible when viewed in first-person through the camera's viewfinder; the only other instance of its presence is during nighttime when they can be located, without the use of a camera, due to a light flashing where the snapshot is supposed to be. 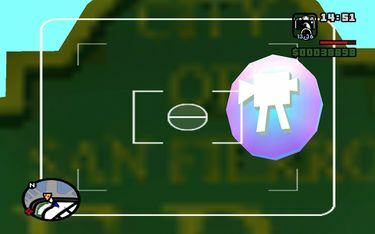 To successfully capture a snapshot, the snapshot icon must be within the camera viewfinder, though it is possible to take some snapshots from very far away as long as the player aims it precisely. Sometimes zooming is required to capture a more distant icon. The point of interest above which the icon sits is not required to be in the viewfinder, simply the icon itself. The photograph can be saved, if desired, by taking the photo using the save mode on the camera. The player does not however require to have the snapshot icon in sight, as it seems that they can acquire the snapshot no mater what is in front of it; this can be useful for the snapshots that require the player access to a helicopter or certain parts of the map that are not unlocked yet - namely the three icons on the bridges, the one in the naval base and other tricky shots. Each captured snapshot awards the player $100. The final reward for capturing all 50 snapshots is $100,000 as well as four weapon pickups becoming available at the Doherty Garage: A Micro Uzi, Grenades, a Shotgun, and a Sniper Rifle. This page was last modified on 5 October 2012, at 10:32.